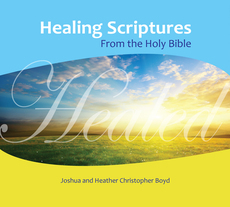 Over 300 healing scriptures (King James Version) read aloud by Heather Christopher Boyd with original soft background music. Over 60 minutes. These CDs are available to encourage you, and to enable you to bless others that may need encouragement. Order a CD for you and a friend. Or download in MP3 format, Audiobook format or listen now.